Navarathri is a festival dedicated to the Supreme Goddesses Durga, Lakshmi and Saraswathi. As the name says Nava- Nine and Rathri- Night, the festival is celebrated for nine nights and 10 days in the month of September-October (Purattasi month, the day after New Moon). Devotees worship the various forms of the Supreme Mother during these ten days. The first three days of the Navarathri festival is dedicated to the worship of Mother Durga - the vanquisher of evils and the giver of courage, the next three days to Mother Lakshmi – the giver of wealth and prosperity and the final three days to Mother Saraswathi- the giver of knowledge and intelligence. The legend associated with Navarathri is mentioned in various Purannas like Markandeya Purana, Vamana Purana, Varaha Purana, Shiva Purana, Skanda Purana, Devi Bhagavatam and Kalika Purana. It is said that it was during these 10 days that the Supreme Mother Goddess Durga destroyed the Demon Mahishasura. The tenth day on which the goddess killed the demon Mahishasura is celebrated as Vijayadasami- The victory of good over the evil. Navarathri is considered a period of purity, and is traditionally an auspicious and religious time. This is one of the biggest festivals celebrated in each and every household of India. The ninth day of this festival is the "Saraswathi Pooja" day. Mother Maha Saraswathi is worshipped on this day. 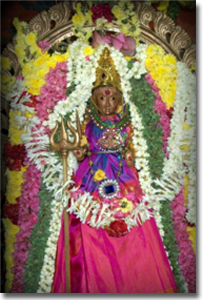 Navarathri is celebrated in all temples in a grand manner with immense devotion and sincerity. In SriAnanthaPadmanabha Swamy Temple, Mother SriAshtadasabhuja Durga Parameshwari blesses all devotees sporting different forms everyday. Every morning devotees gather at SriPadmanabha Swamy temple and recite the Devi Mahathmya and other religious texts dedicated to the Supreme Mother. 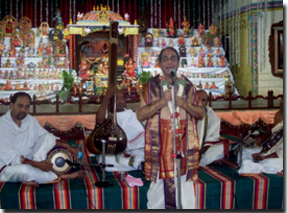 There are grand music concerts and upanyasams in the Kanchi Mahaswamy Anantha Mandapam during these 10 days. 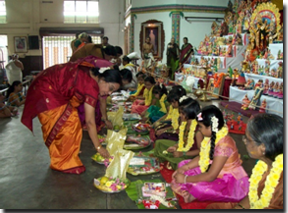 Suhasini pooja is also performed during the Navarathri festival here. 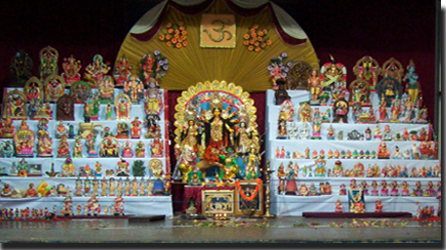 One can also witness the colourful "Golu" during the Navarathri days. One can achieve anything and everything only is he/she has courage, wealth and knowledge. Thus by worshiping the Supreme Mother during the Navarathri time, one gets all that he/she requires for a content, happy life.